Last year, one of my clients generously gave a Christmas gift that keeps on giving. As usual, she and her husband gave me a gift basket stuffed with tasty food items; however, this time they added a very generous new wrinkle. There were four envelopes inside, each one containing a $50 bill. One of her New Year's resolutions, she explained, was to explore the vibrant Nashville food scene that, just as everything else in Music City, has really exploded in recent years. Determined to get herself acquainted with all the deliciousness now available in her own backyard, she wanted me and my wife to use the money on our date nights and report back to her. "Take an envelope each time to help offset your costs," she instructed. "Then please give me a review of where you've been. I want to know what's worth checking out." I've decided I will review four Nashville restaurants, each fairly new to the local food scene, not just for the aforementioned personal-training client, but for all of you, as well. In each review, I will focus on the typical things covered--taste, presentation, service--however, in addition, I will also write about things such as whether or not the atmosphere is conducive to that precious night out with a loved one (environmental/emotional/interpersonal wellness) and whether you can go there and indulge a bit, but not completely blow your diet (physical wellness). These will be Seven Dimensions of Wellness restaurant reviews: I'll be describing and rating these establishments as they relate to the pursuit of optimal health and vitality. A high bar to clear, I realize. But I am optimistic that our Nashville culinary and restaurant talent is up to the task! The first place we visited for this new and delicious project is Nicky's Coal Fired in the Nations. If you are looking to check out fresh, creative restaurants and experience the best of the current Nashville food scene, then this area is a great place to start. The building housing Nicky's is old and industrial, as is much of what you'll see in the area, but significantly remodeled and repurposed for a modern dining experience. Originally built in the 1920s, it was once the site of the Belle Meade Hosiery Mill, and is now part of a slick, mixed-use retail space, reminiscent of the Trolley Barn buildings (but on a smaller scale) in the Rolling Mill Hill area. Even before darkening the door, you will begin to be drawn into an important, and comforting, part of Nicky's ambience: the classic rock soundtrack. Yes, that's right, I said "comforting," "ambience," and "classic rock" in the same sentence. External speakers blasted Boston's "Don't Look Back" as we walked toward the entrance, and the song continued to play as the hostess showed us to our table. Later on, General Manager and Partner Caroline Galzin explained to us that this is a key part of the aesthetic, because, like so many other details at Nicky's, it is the type of music that she and her husband, Executive Chef and Partner Tony Galzin, associate with family and home. All the food at Nicky's has an Italian flare, reflecting Tony's heritage, which includes great grandparents who immigrated to the U.S. from the Lazio region of Italy and from Sicily. The restaurant bears the name of Tony's younger brother, Nick, and the servers sport uniforms, manufactured by an athletic-wear company, displaying the jersey number "82" on the back (the year Nicky was born). 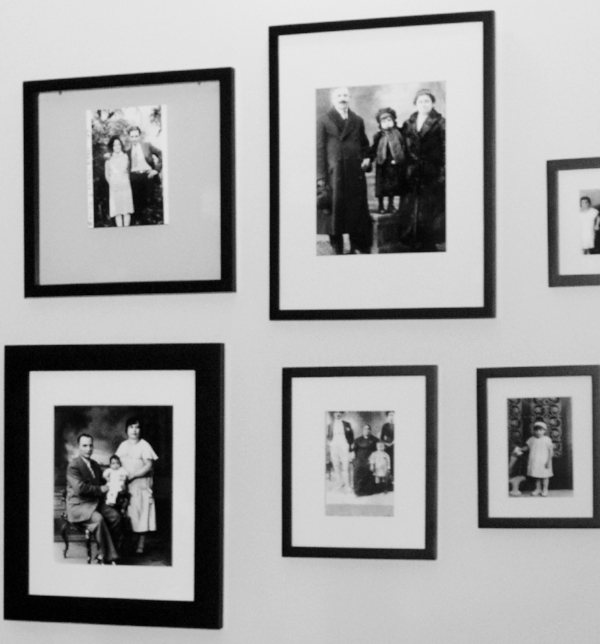 As you enter the restaurant you'll notice that the right-hand wall is covered with family photos going back generations. Even the four-ton, "clean coal" burning, prodigious oven has family ties: "Enrico" is named after Tony's great-grandfather, Enrico Rossi. And Enrico is a huge part of what makes Nicky's the hottest restaurant in this part of town. Literally. On one side of the oven, where the the meats and vegetables are cooked, the temperature reaches 600 degrees; on the side where the pizzas are cooked, the temperature is kept at 750 - 800 degrees. There is always a cut and a catch of the day. On the evening we were there, Nicky's was featuring blackened sea bass from North Carolina, which Enrico efficiently fired to perfection: our entree hit the table mere moments after our antipasto dishes were cleared. The pizzas, we were told, are even faster, taking roughly 90 seconds to cook! Not that we were at all being rushed. We took our time, chatting over a scrumptious drink called Heat of the Moment (even the cocktails have rock-n-roll-inspired names) comprised of Dickel rye, merlet pear, Cocchi Torino, cayenne, and lemon and leisurely grazing on a winter-vegetable blend of pickled daikon radishes, carrots, and artichoke hearts. We also had soft cheeses, thinly sliced salami, and marinated olives, all moderately (and appropriately) portioned and to die for. The perfect timing was simply because at Nicky's they pay attention. When I asked Caroline Galzin if she thought this was the type of place one could eat and not blow his or her diet, she replied with a smile, "It is an indulgence. But one you can feel good about." Everything at Nicky's is organic and either homemade, locally sourced, or can be directly traced to a small farm or fishery. No commodity proteins or livestock here. And they may not have met every single fisherman who provides their daily catches, but they often do know their names. Sustainability and respect for people and the environment are of utmost importance to the Galzins. They work closely with Nashville Grown, a nonprofit food hub that distributes farm products in the Nashville area, and are big supporters of Tennessee Thrives, which promotes diversity and stands against discrimination in Tennessee businesses and communities. But can you eat healthfully at Nicky's? Or is it just a place to indulge after being good for a while? I would say the answer to both is an unequivocal "yes." True, it is a great place to enjoy tasty but not necessarily good-for-you food. The items that are high in saturated fat, however, are at least reasonably portioned, and the accent is on quality ingredients. And there are also some quite healthy items on the menu, such as the daily catch we enjoyed the night that we were there. Certain varieties of fish are rich in omega-3 fatty acids, a polyunsaturated fat essential for brain health that could also reduce the risk for cardiac disease. The American Heart Association recommends individuals consume fish at least twice a week. But let's face it, how many of us cook fish at home, aside from maybe sticking a couple salmon filets in the oven? And how many times per week can you eat filet of salmon or a tunafish sandwich? Therefore, the catch of the day at Nicky's can be viewed as both an indulgence one can feel good about as well as a heart-healthy treat to vary the routine. Need to do some carb loading leading up to an endurance event? Then stop by Nicky's on one of the final nights before the race for some homemade pasta or oven-fired pizza made with ingredients among the choicest in the world. "For our pizzas, we use Italian 00 Flour, which is the finest ground flour available," Mrs. Galzin explained. "It contains a higher gluten percentage which makes the dough stronger, allowing us to stretch it thinner without breaking. It is non-GMO, unbleached, and unbromated. We also source Abruzzi Rye flour, Italian buckwheat flour, and assorted other items such as semolina and faro from Anson Mills. They are a mill in North Carolina which works to grow and preserve heritage grains and seeds. All of their products are non-GMO and organic." I don't know about you, but I can think of no better way I'd like to carb up before a big race! Every dimension of wellness, including the spiritual dimension, is positively touched on through the Nicky's experience. I already mentioned the owners' seemingly constant mindfulness of the greater good, but then there's also this: the playing card attached to our check (see below). This benevolent, Roman Catholic face enveloped in imagery from popular culture was a lovely and quirky touch to finish off the dining experience. A spunky mix of good things set in vibrant colors--a lot like Nicky's. As we left, Chicago's "Saturday in the Park" played us out of the restaurant. It wasn't the Fourth of July; however, it was unseasonably warm, and we were singing Italian songs.